I hope to have ALL of the options for Canadians looking into subscribing to a beauty box in this post. Beauty boxes are so much fun! The way it works is that you sign up and for about 10-15$ per month (depending on which one it is, some are 20$ and seasonal boxes are more expensive with more samples), you get a box delivered to your door containing beauty products.There are different types of beauty boxes available from what I've noticed. For some of these, you fill out a quiz about your skin type and colour and preferences and you get a box with a certain number of samples, which should generally be deluxe (travel size) ones from high end companies, though there are also less high-end companies included and emerging companies as well. And there might be a full sized product in there too sometimes. You should get stuff worth a good deal more than your subscription price when you combine it all and you get to try a bunch of things you might not have tried- what you get is a surprise! I love surprises! 2) Boxes containing their own brand of products. Basically, the box contains full sized products all of the same brand and same type from the company that is sending out the products. It's like getting a discount for being a returning customer and for giving them a lot of business. Like the beauty boxes containing samples, you get to try things you might not have tried but unlike the sample boxes, these are more specific types of products in full size. These boxes are sample boxes available normally every 3 months. Note that the link above is my referral link and would give me points if you subscribe using it. For 12$ per month you get a box containing 4-5 samples. 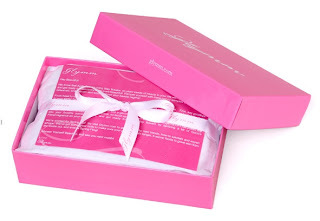 Glymm box comes with a make-up bag which is a cute little extra positive from them but the negative I've read is that the products are not personalized to the person's skin type or tone and they have a lot of little one-use samples (not deluxe). They don't seem to be among the most consistent beauty boxes but rate higher in containing more "high end" products. Glymm has a cool thing available though. A man box for 25$ quarterly (per 3 months). I love the idea of this service but really my husband wouldn't go for that stuff. I have not checked any reviews for this quarterly box. 12$/month. It's not very popular yet since it recently came out but and seems to be getting mixed reviews. One common complaint was the size of the samples... There seem to be lots of little packets (which they add a couple of to make the equivalent of one real sample). 4-5 samples included in each box. Note that this is a USA box that ships to Canada. Topbox is backlogged for a few months but you can still sign up now and get it whenever available. It probably has the best reviews of all the boxes and is the least expensive at 10$ (4 samples). It seems to come strongly recommended (there seems to be a good reason for the strong demand). Note that the link above is my referral link and gets me halfway to a free box if you use and subscribe. This is the only box that I'm subscribed to because of the amazing introductory offer for your first box for 1 cent. That's a pretty amazing offer and you can just cancel it as soon as your box has shipped without a problem if that's what you want. 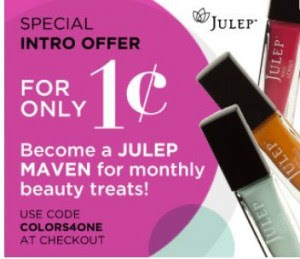 Julep is a company that does nail polishes (and nail care, also foot and hand care and they seem to be branching out with lip balms and glosses). There are 4 different boxes available each month that correspond to 4 different beauty profiles. You take a quiz at the beginning to determine your profile but can change it up at any time. This box is unique in that you see ahead of time what your box will contain. If you don't like the polishes available, you skip the box, send it to a friend or change profiles (or flat out cancel if you want to). A box generally has 2 polishes and a product or 3 polishes and it's 19.99$. There are often additional gifts available like adding a polish of your choice or getting an additional item in your box as a surprise. They have a good referral program (2 referrals = a free box) and mystery boxes available every once in a while. Overall, I really like the box personally but wouldn't pay 20$ per month, every month for just 2 polishes and a product. With the gift, the mystery boxes available and the possibility of a free box from referring, it's a neat little program. It's a seasonal box with a variety of products like beauty, bath and style products. It goes for 26$ per box for 12-15 samples or more and includes full sized products. It says on the website that it's the longest-running samples box in North America and first one to Canada which is impressive! It has stuff that is mostly handmade or from smaller companies so not "luxury" brands but a lot o the time, to me, it's much more interesting and the quality is great in these types of items. You have to put your name on their newsletter to be made aware of the next box sale and you have to be on the computer ready to buy the minute they go on sale if you don't want to miss out. It's not a subscription box but a first come first serve every time and you get a sneak peak of the companies involved in the box to see if you're interested. I am SO on this mailing list! This used to be a monthly box but has become a seasonal box and is requesting people be members before allowing them to see the website... I find it weird. It wasn't getting very good reviews and it seems they are trying to save themselves by trying something different.The new quarterly box is 26$ (about twice as much as the monthly box they were offering) and offers only 1.5x the number of samples (of hopefully better quality than before seeing the additional cost. You can see my thoughts HERE (note that I don't have any first-hand experience). Starlooks Starbox is exclusively make-up in full size and you get 3-4 products per box for 15$ but the shipping to Canada is just too expensive for me to post it above with Julep (which ships for free to Canada). It's really too bad because I would have tried this service. *update note* shipping not 15$ like I saw at the time. Could be worth taking a look! Eco-Emi is a box with organic product samples. I find the shipping to Canada is just too much and I refuse to pay twice the amount that US members pay (30$ instead of 15$) so I'm not interested for that reason. Blissmobox is a box with natural products which would qualify in the first category (except it's not only beauty products) if it only shipped to Canada. I mention it here only because it should be starting shipping to Canada "very very soon" according to their website. It's 19$ per month. Conscious box, similarly to Blissmobox, is a box with natural products (and they have a strong focus on green and ethical businesses) gearing up to ship to Canada but not yet. Also 19$ per month. Editted for better presentation and updates. great post!!! there are so many boxes that i had never heard of. i'm really intrigued by quarterly co.
have you heard of bark box? it's a subscription service for your dog but sadly too expensive for me. Thank you ellesy for being the first to comment on my new blog! I haven't heard of bark box but I might have to put it in "other"!